Blondies Kitchen, one of my favourite Old Street pop-ups from last year, are opening a pop-up Milk & Cookies Bar in Selfridges Food Hall in May 2017. Running from 1st - 29th May 4th June 2017, it'll feature all their favourites - see the 'Kinder Cookie' above - plus some specials for the pop-up including a raspberry & coconut cookie. This will be so popular! 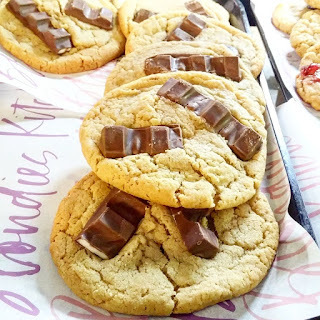 "Following the success of their Old Street Station pop-up, Blondies Kitchen has announced their first retail collaboration with Selfridges, where they will launch their hugely popular milk and cookie bar on Monday 1st May. The new pop up will be launching as part of Selfridges ‘Our House’ scheme which celebrates tastes of home. For one month only, the brand-new Raspberry & Coconut cookie and Frosted Flakes cereal milk will be available exclusively at the Selfridges’ Foodhall pop-up - a limited edition pairing not to miss out on. Known for their delicious freshly-baked cookies with just the right amount of chew, crunch and ooze, Londoners can now find the blonde baking duo at Selfridges’ Foodhall from 9.30 to 21.00, Monday to Saturday and 11.30 to 18.00 on Sundays throughout the month of May. Their signature Cookie Icon - two classic milk chocolate cookies sandwiched together with an outrageous honeycomb chocolate mousse - will also be back due to popular demand. Gluten-free and lactose-free diets are also catered for with the return of Gluten Who? peanut butter oats cookie and almond milk by Plenish. Selection boxes will now be available, which are the perfect gift any cookie lover."